Line Dancing begins by being squishy to define, but let’s try. It must be choreographed in order to recognize it from several more ancient forms of folk dancing such as some American Indian dances as well as Balkan dances which though having evolved over the centuries are not choreographed. 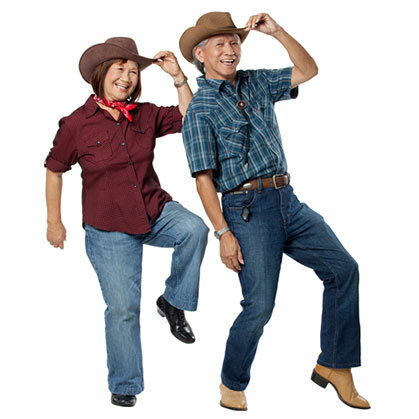 Obviously, line dancing has as one of its sources folk dancing, but it is not, only because its lineage is too recent. Its form depends on the numbers of participants: a small group may produce only one line; larger groups will have several parallel lines. There are no interactive moves between the dancers, only planned movements which are synchronized. It has an interesting history, even though relatively recent, with a number of musical influences. Since Line Dancing began in North America, it can be assumed that it was borne out of the folk dances brought by immigrants from Europe, cultures from the Balkans, England and interestingly, Austria. The Balkan kolo, the English morris and the Austrian landler are all cases in point. There may be an improbable connection with the folk dances of the American Indians although this again falls in the “squishy” category because most Native American dances were circular. With a stretch in the imagination, there were several dances done in the 1960s that might be connected to line dances, dances such as the Hully Gully done in lines with standardized step routines. The Bunny Hop of the 70s and the Stroll were also “almost” line dances. The real line dance, however, began at a 1980 New Year’s party in Nashville choreographed by Jim Ferrazzano and called the Tush Push. It was generated initially from cha-cha music with obligatory hip bumps and pelvic thrusts. The next step in evolution was also in 1980 but in Texas where The Travelling Four Corners and the J R Hustle of country and western derivation were adapted to line dancing. With the movie Urban Cowboy came two more line dances, Cotton-Eyed Joe and Two Step, followed in mid-decade by Electric Slide and the Freeze, both of which resulted from the Oakridge Boys hit country song, Elvira. Yet, in the 80s line dancing was not only country and western but also pop and rock ‘n roll. The early 90s, however, was where history was made, and it was done so by the same lady who wrote down Jim Ferrazzano’s dance steps on New Year’s 1980, Melanie Greenwood. As part of the promotion for Billy Ray Cyrus’ Achy Breaky Heart, she was tasked to choreograph a dance for the song. Of course, the song and line dancing became hugely popular, and all of a sudden was “the” venue throughout North America as well as Europe and Australia, then completely identified with country music. Although during the 90s, line dancing consumed the country music market, by the end of the decade it began to venture into non-country music with its return to pop. In the UK, most line dances are now done to various musical styles including soul, R&B, country rock, rock, pop, even salsa. Australia and the US have maintained a close connection with country music including all the cowboy regalia, hats, boots, etc. It begins to look as though the “country music” infatuation of line dancers may be a phase or that a split may be occurring with line dancers in the UK and Europe going back to the early disco days while the US and Australia remain centered on the simpler dances of country music. So for a dance form that has some very intense dance steps, from stomps, touches or points, which sponsors moves backward or forward, staccato or slide, scissors or spirals, and which requires dedication to form reminiscent of the Charleston, the evolution of line dancing continues, perhaps shedding its cowboy image, perhaps not. Whatever its future, line dancing has enamored millions of followers worldwide with reason. Maybe, just maybe, you may want to become one of their number.